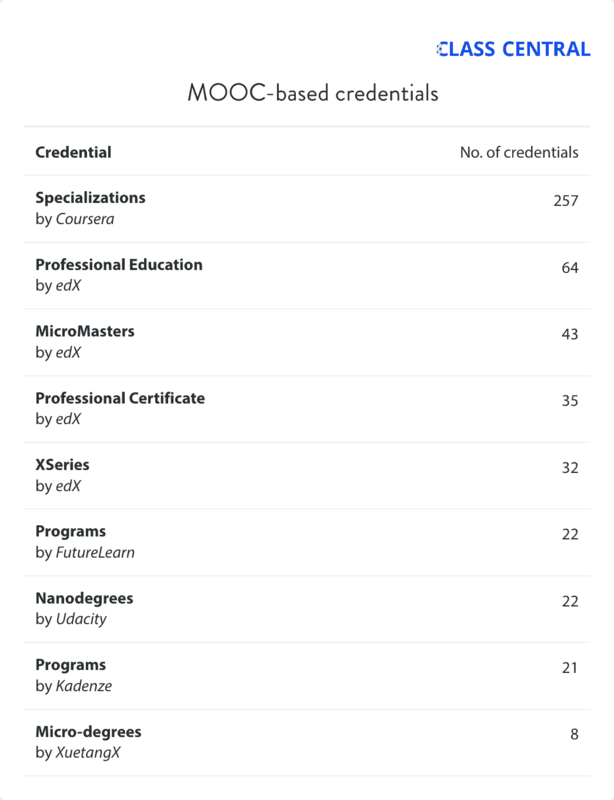 The MOOC landscape has grown to include 9,400 courses, more than 500 MOOC-based credentials, and more than a dozen graduate degrees. 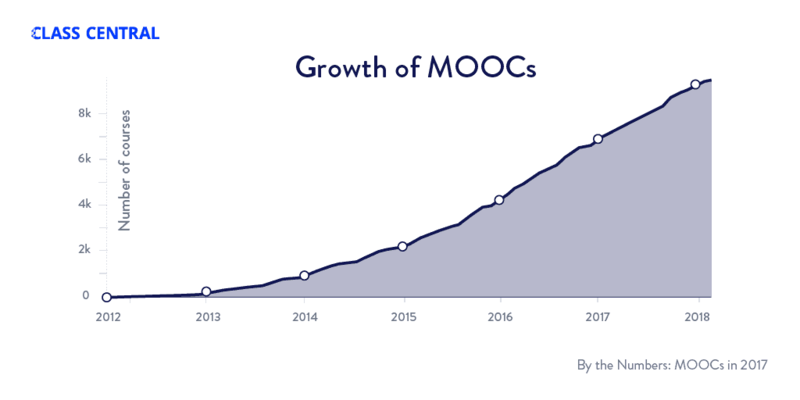 The total number of MOOCs available to register for at any point of time is larger than ever, thanks to tweaks in the scheduling policy by MOOC providers. However, for the first time we are seeing a slowdown in the number of new learners, which is a direct result of a shift in priorities towards users who are willing to pay. According to data gathered by Class Central, around 23 million new learners signed up for their first MOOC in 2017. That’s similar than the 23 million new learners who registered for a MOOC in 2016. The total number of MOOC learners is now 81 million. Udacity — 8 million users. Though growth in new learners has stalled, the number of paying users has increased. Coursera saw paying users increase by 70% this year. Meanwhile, Udacity has more than 50,000 paying students enrolled in its Nanodegree programs. As the MOOC platforms continue their quest for sustainable revenue models, MOOC providers have begun charging not just for certificates and other credentials, but for access to content. 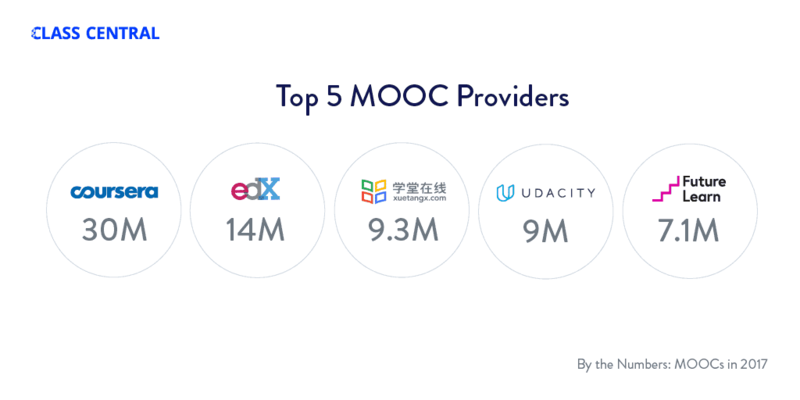 The big MOOC providers now have a product at every price point — from free to millions of dollars. Efforts over the years in online degree programs and corporate training products are showing results. The total potential revenue just from students currently enrolled in these online degree programs offered on the major MOOC platforms now exceeds $65 million. The pace at which new courses are being added has increased slightly (this might also be attributed to shorter courses being offered as part of a sequence). To date, over 800 universities around the world have launched at least one MOOC. 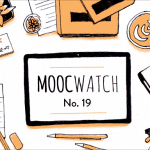 The number of announced MOOCs stands at 9,400, up from 6,850 last year. Keep reading Class Central’s comprehensive analysis to learn more about MOOCs in 2017. Originally, all MOOCs were offered as free courses. While content varied greatly from course to course, MOOC providers essentially offered a single product: university courses packaged for online audiences and offered free of charge. The big MOOC providers have now developed products and services that range in price from free (or partially free) to costing millions of dollars. 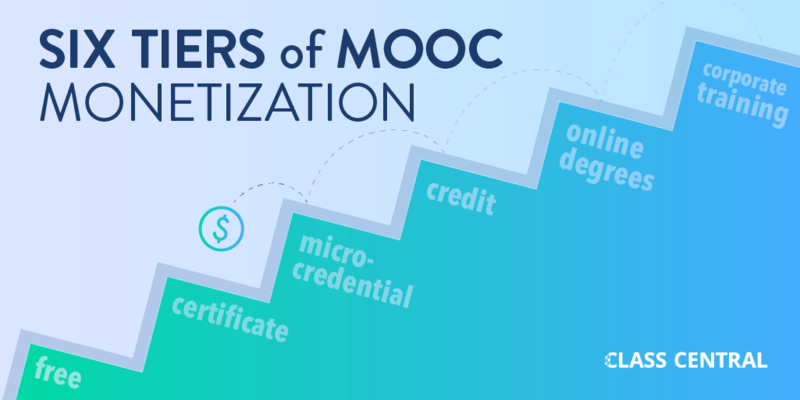 Class Central has identified six different tiers that MOOC providers monetize on: free (or free to audit), certificate, micro-credential, university credit, online degrees, and corporate training. Each tier of pricing adds some value on the tiers below it. Essentially, the same product (the one that anyone can register for, free of charge) is being monetized at different pricing levels, with the free product acting as a marketing channel that feeds customers into other higher priced products. When MOOCs first started out, they were all completely free. Their free-ness, in fact, was what distinguished MOOCs from other kinds of online courses. However, as the MOOC platforms search for sustainable business models, we have increasingly seen content placed behind paywalls. 2017 saw a continuation of the shrinking of free, as we have discussed in a previous analysis. MOOCs now exist along a spectrum, with fully-free courses at one end (yes, they do still exist) and completely-paid online courses at the other end. Coursera has put graded assignments behind paywalls, FutureLearn has developed a time-based paywall, and Udacity (after proclaiming MOOCs are dead) seems to have given up on the whole concept of free and is aggressively moving towards monetizing content. Though edX hosts paid-only courses, it remains the only platform that still offers most of its courses for free (minus the free certificate). The narrative in the early days of the MOOC space was around the disruption to universities. Six years later, we know that MOOCs are not going to lead to the demise of universities. However, according to the previous CEO of Coursera, Rick Levin, while MOOCs may not have disrupted the higher education market, they are disrupting the labor market. The real audience for these courses is not the traditional university student but what Levin calls the “lifelong career learner”: someone who might be well beyond their college years, but takes online courses with the goal of achieving professional and career growth. The MOOC platforms’ entry into the markets for online degrees and corporate learning isn’t a new trend. However, this year saw a few new developments, and even a few milestones achieved. Quite simply, online degrees and corporate training are existing markets worth billions of dollars, and MOOC providers want a slice of that. Several new MOOC-based online degrees (or plans to launch online degrees) were announced in 2017. More than 7,000 students are enrolled in these online degrees and the total potential revenue exceeds $65 million. On the corporate training side, Coursera ended 2017 with more than 500 companies signed up for its Coursera for Business service, up from 30 last year. 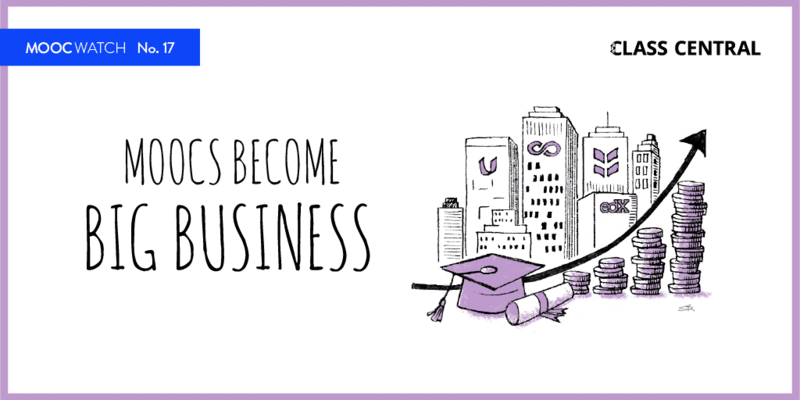 EdX for Business is now working with 40 companies. As for the past several years, MOOC providers have continued to make their product more flexible and convenient. Scheduling tweaks have made it possible for many MOOCs to be made available throughout the year so that learners can start them immediately. Up to now, efforts to offer university credit for MOOCs have been targeted towards students who are enrolled in on-campus degree programs at the universities that produced the MOOCs in question. Now, for the first time, we are seeing examples in which on-campus students have the option to earn credit from MOOCs — even from universities other than the one they attend. In the U.S., for a certain course at Georgia Tech and MIT, students were given a choice: enroll in the traditional on-campus course, or sign up for a parallel version of the class that would be completely online. Meanwhile, in the Netherlands, TU Delft ran a pilot to let their students earn credit from MOOCs offered on edX by other universities, via a Virtual Exchange program. At the end of 2017, TU Delft signed an agreement with eight other universities. Now, students from this entire group of universities can earn credit for each others’ MOOCs. The universities participating in this program are: the Delft University of Technology (TU Delft), the Ecole Polytechnique Fédérale de Lausanne, Wageningen University and Research, Rice University, the University of Queensland, the Australian National University, the University of Adelaide, the Hong Kong University of Science and Technology, and Leiden University. More than 500 MOOC-based credentials are now available. 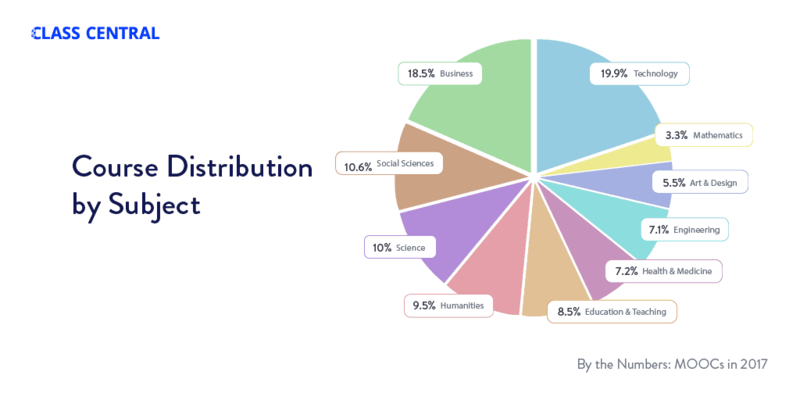 Coursera’s Specializations lead the pack with over 250 credentials. 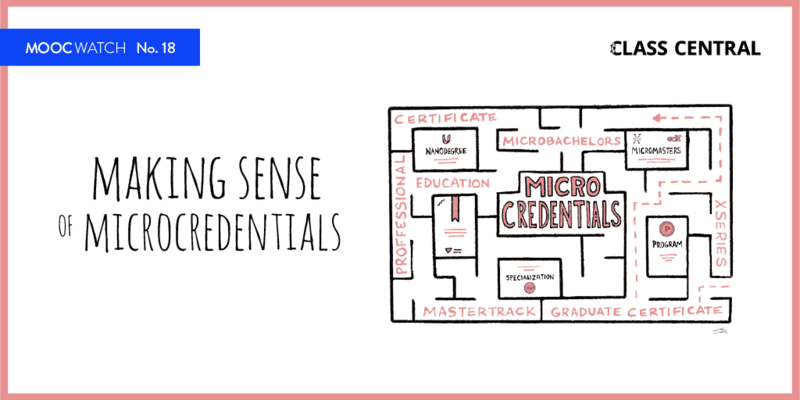 It’s followed by edX, which has around 170 credentials split across 4 types: MicroMasters, XSeries, Professional Certificate, and Professional Education. XuetangX also launched eight “micro degrees.” Many (if not the majority) of the new courses that were launched in 2017 are part of credentials. A few of the longer courses originally launched in 2012 and 2013 have also been split up into multiple courses and re-launched under a credential. Online graduate degrees are a lucrative monetization opportunity for MOOC providers. Initial results from these MOOC-based degree programs have been good. The Online Masters of Science in Computer Science (Udacity and Georgia Tech) has around 6,000 students enrolled. The iMBA (Coursera and the University of Illinois) has over 800 enrolled students; meanwhile, the Online Masters in Analytics (edX and Georgia Tech), announced at the beginning of 2017, has 650 students enrolled. A simple back-of-the-envelope calculation tells us that the potential revenue to be earned from these three degrees is greater than $65 million, based on the current number of enrolled students. Coursera plans to launch 15–20 degrees by 2019, while FutureLearn has announced that they will launch 50 degrees in partnership with Coventry University. XuetangX also announced three online Master’s degrees with Zhengzhou University. Coursera is still the largest MOOC provider in the world with over 2,700 active courses. (Coursera has launched over 3,000 courses, but many have been removed.) 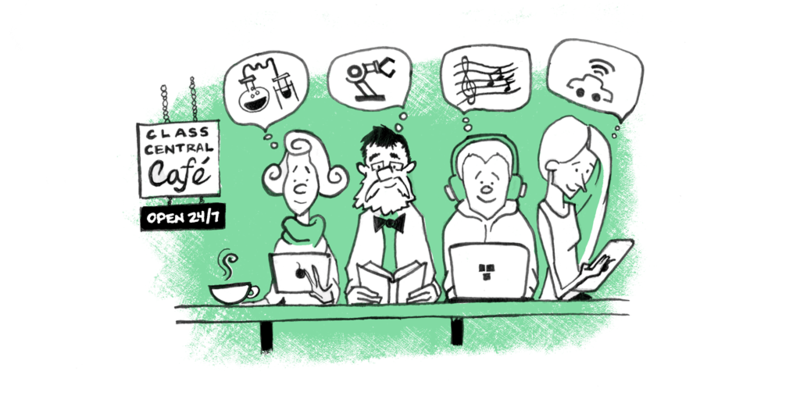 EdX currently boasts a catalog of 1,800 courses, while FutureLearn has 700 courses. This year we also saw the launch of a regional MOOC platform called ThaiMOOC, which is the official MOOC platform of Thailand. A comprehensive list of MOOC providers, including regional providers, can be found here. Class Central is primarily a discovery platform — students prefer to browse rather than search on our site. Our Subjects page (built using an online course taxonomy, which we open-sourced) enables a student to browse courses based on their interests. Only 4% of students end up using the search functionality on our site, but those students still ran over 475,000 searches using around 110,000 unique search terms. The top 25 search keywords are below. These account for 10.5% of all our searches. We compiled this list based on how many Class Central users have added a particular course to MOOC Tracker, our watchlist feature (courses have been added to MOOC Tracker more than 2.5 million times in 2017). Learn more about MOOC Tracker. 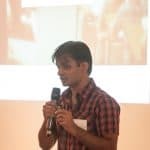 Startup School from Y Combinator. Mindshift: Break Through Obstacles to Learning and Discover Your Hidden Potential from McMaster University. Mountains 101 from University of Alberta. Personal Finance from Purdue University. The Science of Success: What Researchers Know that You Should Know from University of Michigan. Machine Learning from Columbia University. Manage Your Prices: An Introduction to Pricing Strategy and Revenue Management from ENAC. Neural Networks and Deep Learning from deeplearning.ai. Entrepreneurship in Emerging Economies from Harvard University. Last year we launched a Follow button for Education. It’s a Twitter-like Follow button that enables learners to customize their Class Central experience by following universities, subjects, and course providers. We are on track to reach eight million cumulative follows by the end of this year. Here are the top followed items on Class Central in 2017, and the number of total followers they received in 2017. Harvard University — 118,541 followers. Computer Science — 117,673 followers. Stanford University — 112,026 followers. Management & Leadership — 84,649 followers. Data Science — 84,476 followers. Personal Development — 83,144 followers. Over half a decade since their debut, MOOCs may finally have found their footing and a sustainable revenue model. No, they didn’t disrupt universities, but they may have changed how working professionals access continued learning and career advancement opportunities. The tiered monetization models enable MOOC providers and universities to monetize efficiently. The credibility and quality of the lower tiers is boosted if the same courses are available to earn credits or count towards degrees. And who knows, 2017 could just have been the year MOOCs became big business. Update March 10, 2018 : Earlier version of the article mentioned Udacity has 5 million learners and 78 million cumulative learners by the end of 2017. Its now been corrected to 8 million learners for Udaicty and 81 million cumulative learners for the MOOC space. i am so exciting for been a potential student university of colifonia, berley.